Lenovo Beats LG To Become 3rd Largest Smartphone Vendor, Android Has 82% Market Share! For the first time in the history of smartphone sales, Lenovo has become world’s third largest smartphone vendor, as it surpassed LG Electronics and sold 12.8 million units in the third quarter of 2013. 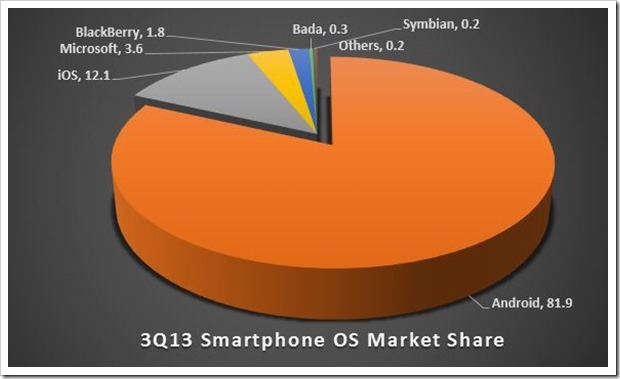 Android remains world’s most preferred operating system with 82% share in the overall market of smart phones. Analysts are predicting overall 1.8 billion units of mobile phone sale by the time 2013 finishes. These facts were revealed in the Gartner’s Q3 report for global mobile sales in 2013. – Smartphones continue to outsell feature phones globally. This trend had started in the last quarter, when for the first time ever, more smart phones were sold compared to feature phones. Overall, out of 456 million mobile phones sold all over the world, 250 million or 55% were smartphones. Last year in the same period, smartphones accounted for just 40% of the total mobile sales. – In the overall sale of mobile phones, Samsung is the clear winner as of now. Capturing 26% market share, Samsung sold 117 million units in Q3, which is an increase of 3 percentage points compared to last year. – Despite all bad news, Nokia is still world second largest mobile phone vendor, as it sold 63 million units in Q3; although this 13.8 market share is nearly 6 percentage points lower compared to last year. – Apple is at #3 in overall mobile phone market, with 6.7% market share. It sold 30 million units in Q3, which is an increase of 1 percentage point. Point to note that the holiday season has just begin, and Apple is known to be a killer for this phase. The next quarterly results would be interesting to watch out for Apple. – In smartphones, Samsung is again the clear winner. It has captured 32% of market share with sale of 80 million units in Q3. Total of 250 million smartphones were sold globally last quarter. – Apple is at #2 with 30 million sales and holding on to 12% market share. Compared to last year, although the total number of units sold has increased by 6 million, but the market share has come down by 2 percentage points. – And the clear winner in the smart phone segment is Lenovo, which has become #3 biggest seller of smartphones all over the world. LG is now at #4 position, Huawei at #5 position with 11 million units sold. 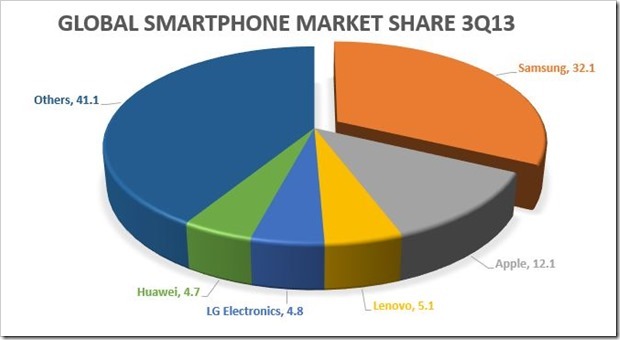 In case you are from US or any other western country and wondering how Lenovo became a market leader in smartphones, then you are not to be blamed. Lenovo is riding on its domestic market success in China, which accounts 95% of all Lenovo smartphone sales. – If we observe the Operating System market, then we can see that Android is still holding the fort, without any visible threat from anyone near. In the last quarter, Android enabled smart phones has captured whooping 82% of all smartphone sales. Out of 250 million smartphones sold worldwide, 206 million were on Android platform. – iOS from Apple is at #2 and Microsoft is still at #3 position with 8.9 million units. Last quarter, Microsoft had jumped to #3 position by beating Blackberry, and the trend continues. – Blackberry OS is at #4; Bada OS at #5 and Symbian at #6. A very interesting observation which was made regarding sales of Android enabled phones globally: Other OS developers and vendors are obviously worried about the 80% market share but it is also worth noting that almost 40% sale of all Android devices worldwide is coming from one region: China. And when this market becomes saturated, the market share of Android can seriously come down. Besides China, India is the next biggest market for Android enabled phones. Slowly other operating systems such as Firefox are also entering the system, and it is expected that the market equations will change in future. But for time being, its Samsung and Android which are calling the shots; and the holiday season would be really interesting to look out for.